I really love adding colour to my baking. The Wilton gel colours are so fun and easy to work with, over the past few years I have been colouring everything I can. I've made colourful cake for cake pops, sugar cookies, various icings, fudge, green bread, and my all time favourite colour experiment: rainbow cake. I really do find it a lot of fun. 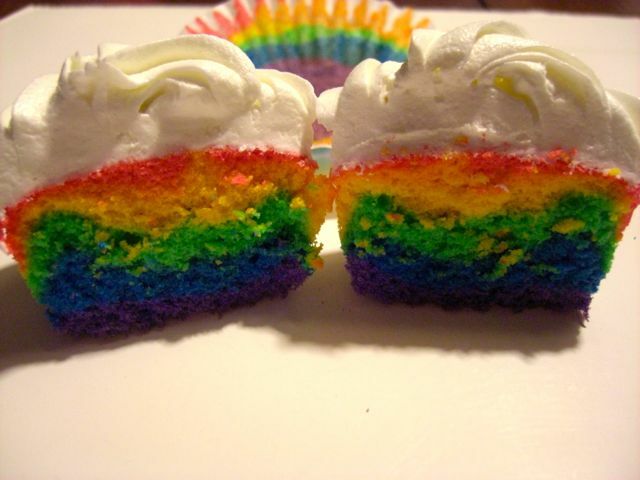 This past weekend I transformed the rainbow cake idea into rainbow cupcakes. 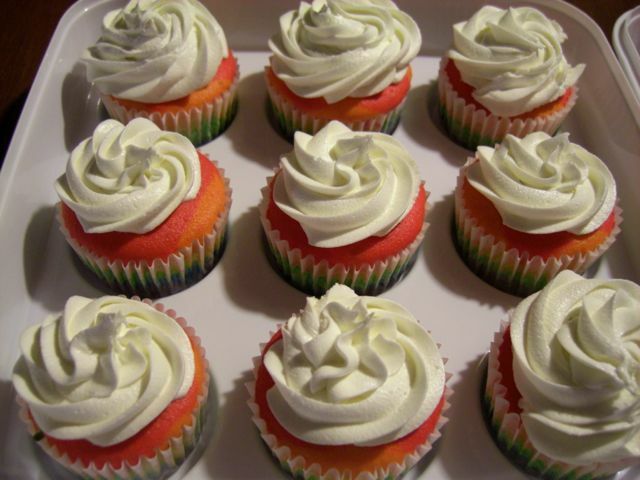 I used marshmallow buttercream for icing and I ended up with some pretty rainbows with clouds on top. I love these cupcakes (even the cupcake wrapper looked good). Step 1. Gather supplies: Prepared cake batter, food colours, bowls, and spoons. Step 2. 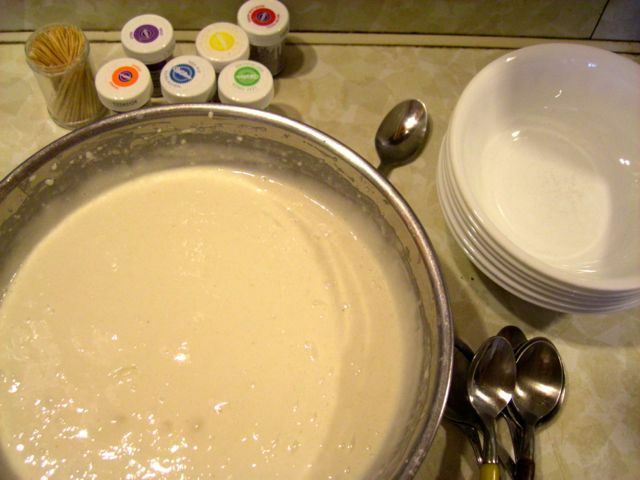 Separate the batter evenly between 6 bowls. 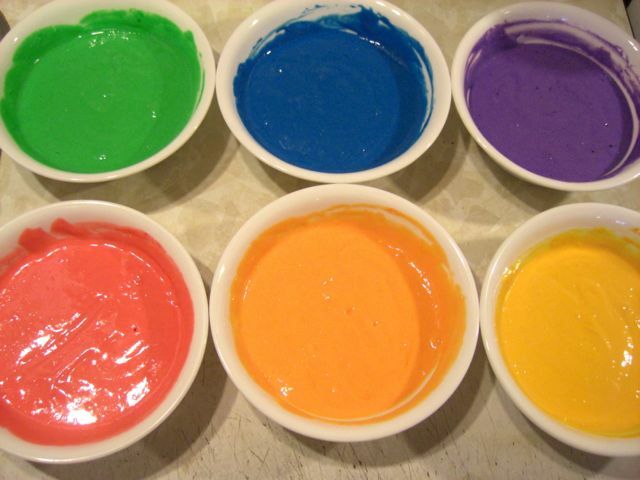 Dye each bowl a colour of the rainbow. Step 3. This is the tedious part and requires a bit of patience. 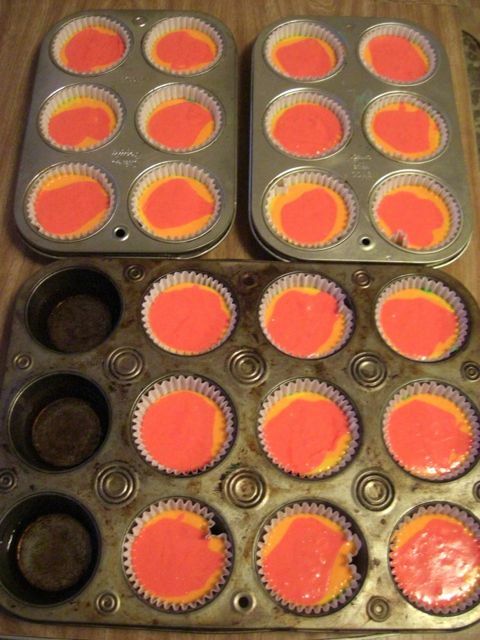 Layer your colours into cupcake pan lined with baking cups. I sat at the table and did this and it took me about 45 minutes to make 21 cupcakes. So just be aware that this will take time. 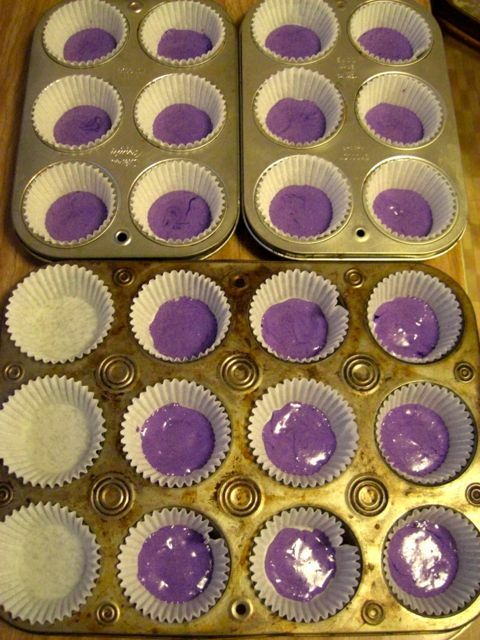 Start at either end of the rainbow spectrum (I started with purple) and add colours in order (or reverse order) along the spectrum R-O-Y-G-B-V. For the first layer, I used a toothpick and spread the purple batter out evenly to ensure the bottom of the baking cup was completely covered. 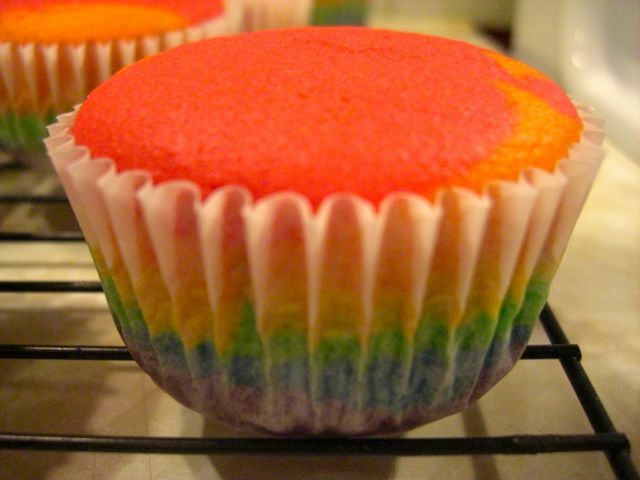 Keep adding your colours, 1 teaspoonful at a time until each cupcake has six different colour layers in it. Don't worry about the colours spreading evenly across the batter below it, I found that gravity and the baking process evened them out for me. Step 4. Remove from oven and cool on wire rack. 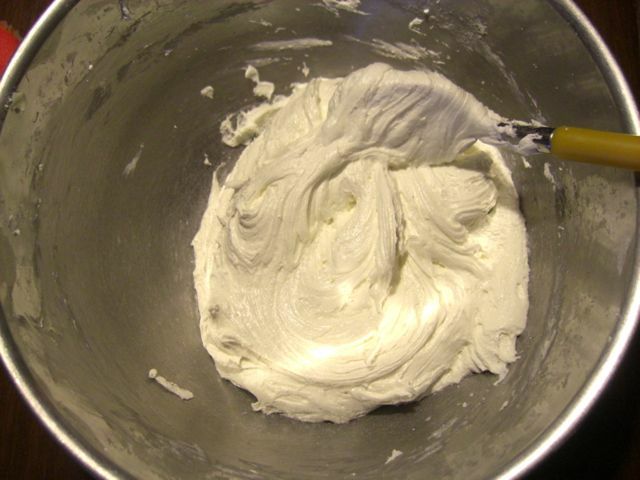 I previously blogged about Marshmallow Buttercream here. To prepare: cream butter. Blend in icing sugar in 1/2 cup intervals. Stir in 1 jar of Marshamallow fluff. Done. 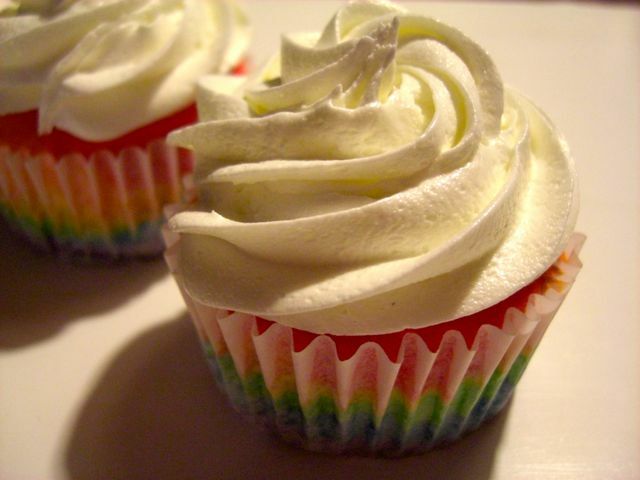 This icing is both easy and tasty. I thought the marshmallow in the butttercream would add a cloud like feel to the top of the cupcake, so I prepared it and piped it on using a 1M tip. Absolutely loved how these turned out. So pretty and fun to eat. 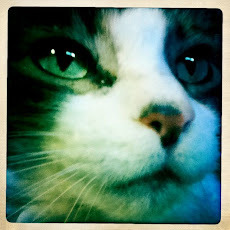 You are my last blogger stop and then back to the kitchen I go. This morning I wrote an Italian cheese bread dough. So fun to start the day, writing bakes. And YUM, on your little cakes. Love the colors. So much fun. 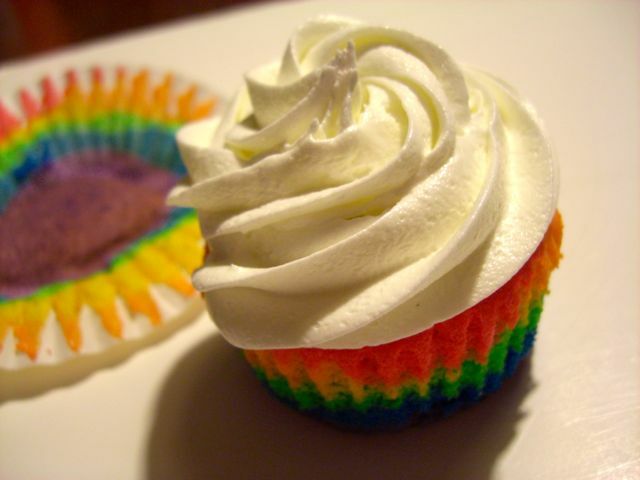 And the icing, neat idea using the fluff. Never tried that, looks amazing. Cheers to you my friend and a GREAT BIG BOOGIE BOOGIE. Mmmm... Italian cheese bread sounds delicious. That does sound like a lovely way to start the day. The fluff in the icing is just so...nice. It makes it less sweet somehow and makes for a really light icing. 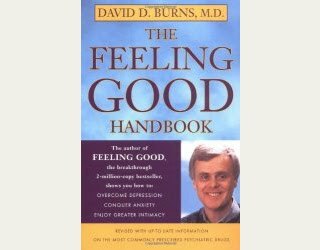 It is really, really, good. Got burned but the croutons were killer. So much so that I'm going to test that same method to make stuffing cubes and more croutons, as well as bread crumbs. Oh my, they are very pretty and look delish. You just stirred up my sweet tooth. Although it don't take much. Very nice. Cheers!! Thanks so much. 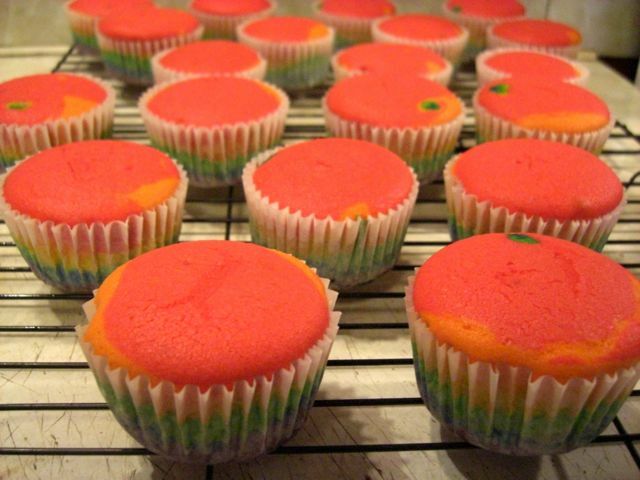 They are very fun cupcake.